If you love history and have fond memories of Mississippi you would like to preserve, you must get your hands on a new publication, hot off the press. It’s called “Early Postcards of Starkville – A & M College” and the volume is priceless! 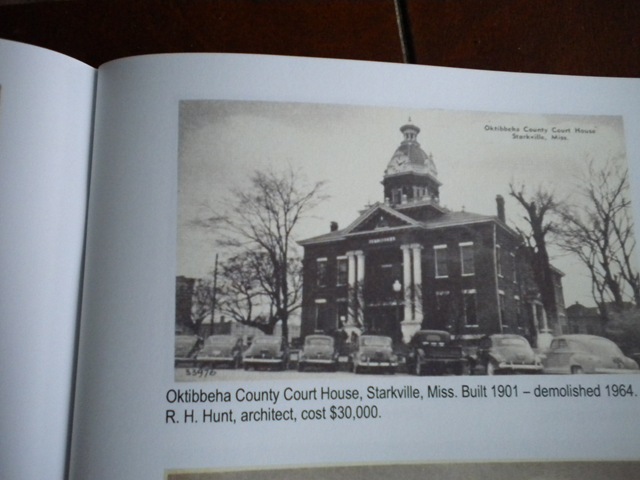 Pictured above is the Oktibbeha County courthouse before it was demolished in 1964. Who ever made that decision should be ashamed! The book is a credit to Ruth Morgan who spent untold hours collecting the postcards, interviewing families, researching the locations and seeing the project all the way through the printing process. 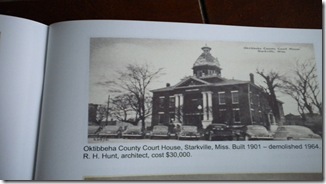 The project is a fundraiser for the Oktibbeha County Historical and Genealogical Society. The black and white edition is $10 and the color version is $15. At left, the cover shot was taken in 1905. It is University Drive shooting from downtown toward campus. The road was constructed of rocks, and we found that a golf course once existed on the left where you can barely detect a split rail fence. Considering that golf was relatively new to this country, I have to believe this might have been one of the oldest golf courses in the state. We don’t know what happened to it or who operated it, but my home, known as the old Blumenfeld home, sat on the left somewhere down that lane. 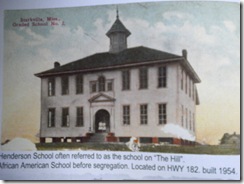 At left is a postcard depicting Henderson School – often referred to as the school on The Hill. 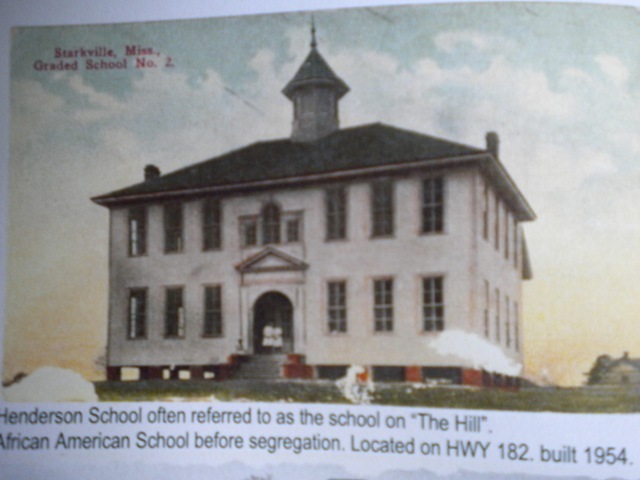 It served the African American students before desegregation. Below you can see Overstreet Elementry (which is on my street) as it appeared at the turn of the century. If you squint real hard you can see my house on the far right. I think we had chickens. I apologize for the quality – it’s not the book, it’s my photography. I didn’t know my new Lexmark printer doesn’t allow one to scan a photo to the computer. So I had to take a picture with my camera. My favorite postcard depicts the old Hardy Athletic field as spectators line the field intent upon a ballgame a century ago. There are no bleachers, much less chairbacks or skyboxes. Horse drawn carriages are parked around the perimenter. 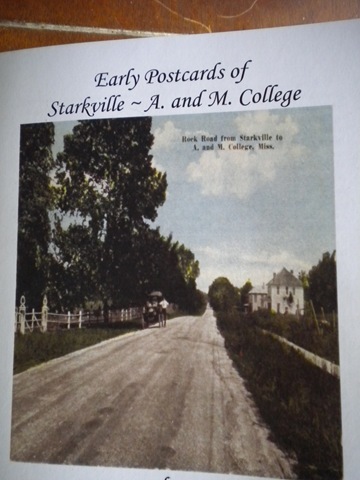 The book contains more than 90 postcards sent to various residents during the 20th century – some with the original notes still scrawled on the front. It is WONDERFUL! 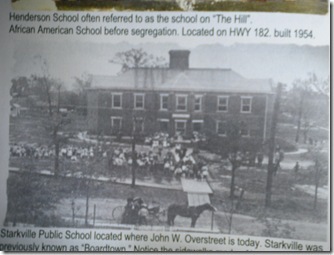 This entry was posted in General Stuff and tagged Postcards from Mississippi, Postcards from Starkville and A & M College by Emily Jones. Bookmark the permalink.